This Canadian movie came out in its home country in 2011--it was actually nominated for Best Foreign Language Film at last year's Oscars--but didn't get a Stateside theatrical release until 2012. Monsieur Lazhar is the story of an Algerian political refugee who becomes a schoolteacher in Montréal. The film explores the protagonist's relationship with his students, and how that reflects his insecurities about his home and his past. It's very much a Debbie Downer kind of movie, in a good way. The film is understated and quiet. If you or someone close to you is a teacher, you'll appreciate Monsieur Lazhar. The movie also deals with the anxieties of immigration in a new and interesting way that I hadn't really seen in any film before. And the cinematography of wintry Montréal is gorgeous--my mom told me it reminded her of iconic Canadian children's book The Hockey Sweater. Netflix availability of Monsieur Lazhar: Instant streaming! Yay! Another depressing, quiet, understated 2011 foreign film released in the United States in 2012? Oslo, August 31st comes from Norwegian director Joachim Trier, creator of Reprise, one of my favorite movies of all time. He's also the cousin of polarizing Danish director Lars von Trier. Oslo, August 31st tells the story of Anders, a guy trying to put his life together after getting out of rehab. He's played by the superb Anders Danielsen Lie, who also starred in Trier's Reprise. The whole film takes place over a period of 24 hours; we see Anders struggle with old friends and a lifetime that's seemed to pass him by while he was away. In true Scandinavian fashion, Trier uses a minimalist style of filmmaking. The sparse dialogue is realistic and sounds as if much of it may have even been improvised by the actors. It's a demonstration of "show and not tell," as the viewer must come to their own conclusions about the storyline and its meaning. Netflix availability of Oslo, August 31st: This one's also instant streaming! Yay! This documentary about Chinese activist artist Ai Weiwei was eye-opening for me. I consider myself a fairly "hip" and "with it" sort of guy, but we all hear the horror stories of government censorship in China, so I wasn't aware someone like Ai Weiwei could even exist. As we see in the film, he has to go through a lot and he gets detained all the time, but Ai makes it work--not out of an apartment in New York City, but in his hometown of Beijing. His art itself is visually arresting, but Ai's charisma and political defiance are really what steal the show. Never Sorry shows foreign audiences that although we're taught to believe China is this imposing superpower menace, it's a country full of real people with independent thought who can be just as provocative, creative, and hilarious as the rest of the world. As far as art documentaries go, I'd put Never Sorry on the same level as Banksy's groundbreaking Exit Through the Gift Shop. Netflix availability of Ai Weiwei: Never Sorry: Instant streaming yet again! Netflix is great, isn't it? The only American movie on my list! Beasts of the Southern Wild is a masterpiece of magical realism, a genre not explored deeply enough in American cinema. The movie is about the relationship between a six-year-old girl and her father living in the Louisiana bayou during a hurricane (presumably Katrina). The southern Louisiana setting is critical to both the plot and the fantastic visuals of the film. What makes Beasts feel so authentic is that none of its cast were professional actors--they were all local Louisiana residents. The depiction of southern Louisiana culture and the spirit of its people in the face of insurmountable adversity is inspiring. And while many big-budget films struggle with finding competent child actors, young Quvenzhané Wallis is brilliant; hopefully she has a long and fruitful acting career ahead of her. Netflix availability of Beasts of the Southern Wild: Not instant streaming, but they have it on DVD. Call my #1 choice a cop-out if you want. I've already written an extensive review of this movie, so you can read my full thoughts there. If I weren't a giant Tolkien fanboy, this probably wouldn't be on my list. But I am, so it is. It holds a special place in my heart. Since Peter Jackson's The Lord of the Rings trilogy has been such a huge part of my life the past eleven years, I was expecting to be inevitably disappointed by this first entry in The Hobbit. And true, it didn't quite live up to Lord of the Rings, but then again, how could it? 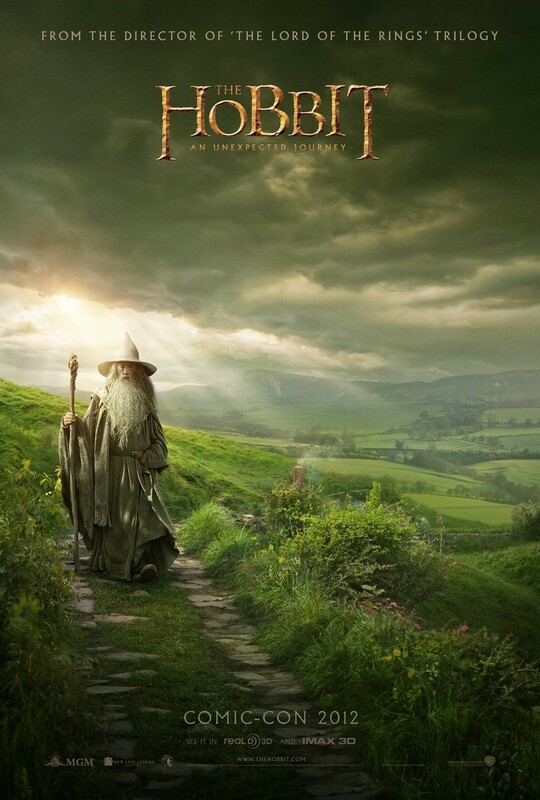 It's based on one short children's novel, while LotR is based on an epic fantasy trilogy for adults. But I was pleasantly surprised, as The Hobbit exceeded all my expectations. If you take it for what it is, An Unexpected Journey is a fantastical romp through Middle-earth. The art direction is inventive and fittingly lighthearted compared to its somber LotR brethren. The added material that wasn't in the book ended up being some of my favorite scenes from the film--Radagast (with bird poop on his face!) and his rabbit-pulled sleigh are awesome additions to the story. Then there's the "Riddles in the Dark" scene. This sequence, featuring Andy Serkis once again as Gollum, is jaw-dropping. It's like watching a brilliant one-act play onstage, and the technology used in Serkis' performance-capture for the computer-generated Gollum captures every nuance of his human performance perfectly. The Hobbit: An Unexpected Journey is worth the price of admission for this scene alone. I can't wait for The Desolation of Smaug next December. Netflix availability of The Hobbit: An Unexpected Journey: It's still in theaters, silly! Go see it! Honorable mention: Many of you are bound to ask me about Quentin Tarantino's new western, Django Unchained. I thought it was great and Christoph Waltz is one of the best actors alive today. But it didn't quite live up to the five movies on this list.